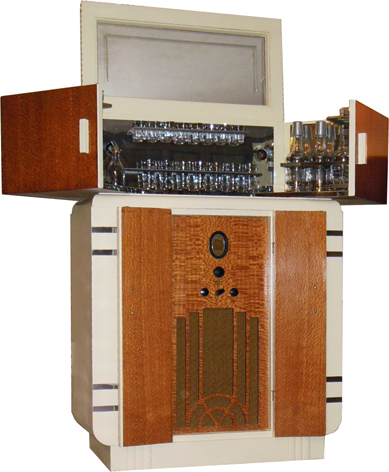 Although there are many different styles of Radiobar cabinets, they all share certain features. The most obvious common feature is the bar. Each bar consisted of chrome plated steel panels that formed the interior surface of the bar. This material was attractive and allowed spills to be easily mopped up. These thin sheets were relatively easy to fabricate using common metal working equipment such as breaks, shears and punches, and this design allowed the company to manufacture panels in various sizes as required. The panels contained cut-outs for the glasses, so that they could be securely held in place as the sides were opened and closed. 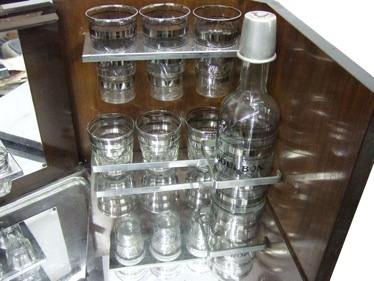 The glasses, decanters and accessories were standard bar sets that were available in stores at that time, and not a style custom made for the company. The cabinets had a light to illuminate the bar area. The earliest lights were small hanging fixtures, but most cabinets contained a bare bulb that protruded through a hole in the back panel. 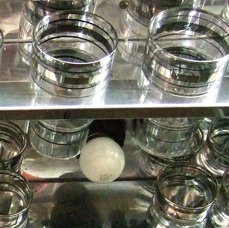 A difficult-to-reach and fragile switch behind the bar operated the light. It is curious that the company did not provide a switch that would turn on the light automatically whenever the lid is raised. It is a simple addition that some collectors today add to their Radiobars. The light bulb used is a common size that is easily found today. started putting a small locking door on the right side of most cabinets. The owner’s stock of liquor could be kept here under moderately secure conditions, however any clever and thirsty thief could rather easily move the cabinet away from the wall and unscrew the thin back cover. 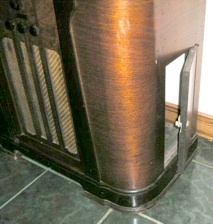 In the 1936 and 1937 catalogs, photos of Radiobars with white painted cabinets are shown. This was in keeping with the fashions of the time. Notations in the catalogs indicate that any of the various styles could be ordered in white for no extra cost (1936) or for a $10 premium (1937). It is likely that the white cabinets were offered in other years as well, although they made up a very small percentage of the production.